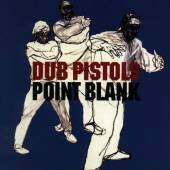 Hip-hop/electronica/big beat with plenty of motion, the U.K.'s Dub Pistols is an album you can dance, rave, or just rock out too. The hip hop will have you bouncing around, while the electronica/big beat sensation will send waves of electricity through your head and have you raving it up all night. "Unique Freak" hits you with some big hip hop beats while "Ghetto" smashes into you with sonic grooves and a Jamaican quality to it. Meanwhile, "Westway" razzles and dazzles with samples, hard-hitting grooves, intense dance beats that do everything, including drawing you in with ease, and wicked momentum that just can't be denied. Of course, the razor sharp edges of the title track or "Anarchy" will cause you to go insane with delight. The music is revved up, super-enthusiastic, and infectious at the same time. You won't find yourself sleeping when this album is blaring. It's deep, intricate sound unravels while you get deeper and deeper into the music. Not a moment goes by that the band doesn't have you in suspense or intrigue. I'll give it a B+.